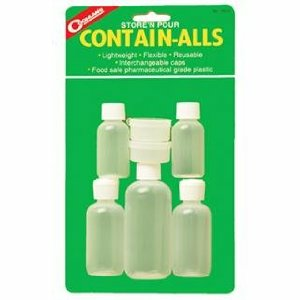 Food safe plastic containers with interchangeable caps for every pourable liquid or solid such as instant coffee, sugar, cooking oil, lotions, pills, ointments, so forth. Set includes: (1) 4 oz bottle, (2) 2 oz. bottles, (2) 1 oz. bottles, (2) 1/2 oz. polycons.